E-mail is not dead. RSS was not the e-mail killer pundits proclaimed. In fact, we are getting more e-mail, more often. Terms like “e-mail bankruptcy” are becoming common vernacular. 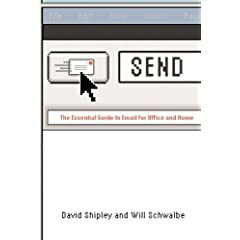 There are entire books and companies dedicated to managing e-mail, speaking to topics like e-mail etiquette or addressing its technical problems. The bottom line: e-mail is here to stay. Perhaps that’s not an earth shattering conclusion but its ramifications are. If we assume e-mail is not going the way of the memo or personal letter in the foreseeable future, then we better learn to play nice with it. We need e-mail on our side, if we want to succeed professionally and personally. That starts by understanding the nature of e-mail itself. We often take for granted the digital properties of e-mail. We forget how instantaneous, perfect, mobile, and “free” it really is. We feel embarrassed when an e-mail is wrongly addressed. We feel surprised when an e-mail is forwarded to the exact person we hoped it wouldn’t. We feel overwhelmed when we get a work related e-mail on our smart phone during a Saturday outing with the kids. It seems that for every good of e-mail, there is a bad. Solving the bad is not that simple. To overcome the bad in an information overload environment requires more than just resolve. We need a mix of technical and non-technical solutions. We need both innovation and a personal discipline to avoid the daily pitfalls of e-mail or even the more severe e-mail bankruptcy. In the last five years, Gmail – the Google approach to e-mail – has probably been the single greatest e-mail innovation. Not only did it transform the consumer e-mail marketplace, by making premium pay-for-storage e-mail services obsolete, it truly bought the power of search to the inbox. The significance of relevant search in the inbox is still vastly undervalued. The prescience of Google’s approach to e-mail is only beginning to be realized: folders, sorting, and compacting inboxes cannot work in a world where e-mail is overflowing and yet any one message so important. Google’s answer: label don’t file, search don’t sort, and archive don’t delete. The totality of the Google paradigm is so different that even the most loyal of Gmail users still don’t “get it.” That’s why there are companies like Xobni, who will likely eventually innovate in the Gmail space, yet took a slightly different approach to deal with e-mail overload: helping the Microsoft Outlook warrior. Xobni’s Outlook add-on learned from Gmail’s search but creates an important layer on top of it: context. The Xobni search functionality is not just about finding e-mails but providing the context around those e-mails such as the people involved in “conversations” or the files exchanged between a sender and a particular recipient. Technology alone does not solve the e-mail problem. Even the most advanced e-mail tools still fall short of providing complete context. More importantly is that these tools will never be able to do one of the most critical e-mail tasks: responding. Today, there are number of formalized approaches that combine technology with personal discipline to ensure the timely and proper processing of e-mails. A sampling of these include principles from GTD, 4HWW, and Inbox Zero. The subtly of these dogmas is that they more closely resemble mindsets or philosophies than cheat sheets of practical tips. That is not to say they don’t include the tactical rules to combat e-mail but rather that their most significant contributions are preparing their followers for the battle itself. There likely will never be one. There will likely never be a singular technology or discipline that works for everyone. The best approach is the plan you develop. The prerequisites to that statement are that you have to: 1) Be engaged in developing your plan. That includes trying out tools like Gmail, Xobni, Google Desktop Search, or SpeedFiler, as well as following thought leaders on the subjects of productivity and e-mail. 2) Stick with your plan. Make it a routine. Better yet, make it a state of mind.